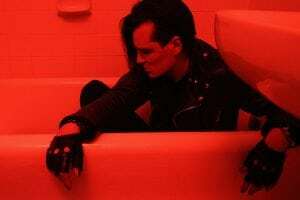 Jyrki 69, lead vocalist for Finnish Goth rockers The 69 Eyes, releases his first solo album via Cleopatra Records Helsinki Vampire, a dark and moody piece of work as its title would suggest. The 69 Eyes have always had a way of weaving catchy hooks into their gothic tapestry and Jyrki 69 doesn’t stray far from their tried and true formula of tarting up a good song with heavy guitars, spooky lyrics and drums with enough reverb on them to sound as if they were recorded in Valhalla itself. On top of this witches brew of song craft sits Jyrki’s smooth as silk baritone, lending the proceedings an air of portent and mystery, perfectly suited for these dark little gothic gems. Although I’m sure these songs sound just fine in the daylight one can’t help but feel these shiny black pearls were created for listening to after the sun sets and well into the witching hour. For fans of The Sisters of Mercy, Danzig and for all of us whose favorite color is black, this one is highly recommended.